It’s not easy to make a high-quality slide-show video! So, after several attempts, I settled for a low-quality, adequate slide-show video with music and birds. 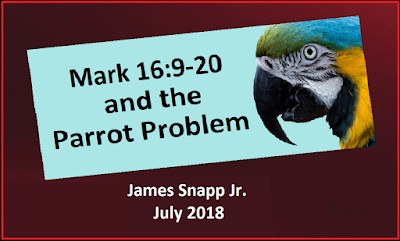 In three minutes, Mark 16:9-20 and the Parrot Problem explains some ways in which some commentators misrepresent the external evidence about to Mark 16:9-20. You can view it on YouTube at https://www.youtube.com/watch?v=RkgokZPJlEA . Mark 6:22 - Whose Daughter Danced? News: Ancient Byzantine Gospels at Mount Sinai! The Sinaitic Syriac: Now in Color!